Originally created as the third component of the Fusillade combat system, the EZ-205 was seen early on as a requirement for long term deployment and maintenance of such a huge Zoid. Originally intended to be built upon the chassis of an EZ-106 Saicurtis, its role as a heavy ordinance carrier quickly overcame the light lifting capabilities of the air/ground structure of the lighter Zoid. An entirely new chassis was designed that could carry far heavier loads and the armor to protect its explosive cargo. After a brief time in production it was determined that the new Zoid had great potential in the support and assault roles even detached from Fusillade units, and stand-alone production lines were established. The earwig form has earned the Sternclaw the unofficial name of “Backstabber” from its crews. The EZ-205 is built on the premise that simplicity is efficiency. It has a reinforced structure that is quite resistant to damage, built to endure long runs at high speed while carrying up to 100 tons of cargo. It has multi-layered composite armor all over, but the ammunition stores are protected by a redundant armor skin with moderate energy shielding. ECM coverage was upgraded to EWS +1 (Electronic Warfare Standard, Plus One) to assist in the Sternclaw’s reaching its host Fusillade in one piece. The primary mission of the EZ-205 is to carry reload magazines of the self-guided V-LAP (Velocity-Enhanced, Long Range Artillery Projectile) rounds carried by the Fusillade’s R3C main guns. These weapons are limited to 50-shot magazines and can deplete their ammunition rapidly with their high rate of fire. The Sternclaw’s abdomen holds 16 reload magazines; one per R3C carried on the Fusillade. Each magazine holds another 50 V-LAP rounds and weighs 6 tons. The Fusillade ejects spent magazines through hatches on the underside of each turret segment and the EZ-205 runs beneath it. The tail claws draw into the abdominal housing and grasp a new magazine fed to them via a conveyor system, then reach out and lift the ammunition into the underside loading hatch of the Fusillade. Spent magazines may be immediately collected, the claw and conveyor systems placing the spent unit into the socket which held its replacement. 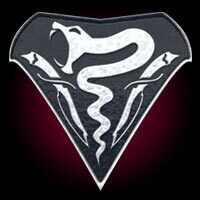 This operation is usually done while the Fusillade is stationary, but the most skilled Sternclaw pilots and engineers can perform this task while running at almost full speed. In its primary mode the Sternclaw carries an array of weapons to defend its cargo. The abdomen section is modular and can be interchanged with various weapons and CP units. It can serve as a minelayer, missile platform, self-propelled artillery system or remote targeting platform. The modular turret is replaced with a crane or other powered systems depending on the mission. Almost more a defense system than a weapon, these cannon are seldom mounted on other Zoids because they have a high level of power use but a fairly short range (2 kilometers). They fire a bolt of cohesive particles that carry with them an exceptionally high energy charge. The impact can cause significant damage to lighter targets but, more importantly, there is a strong probability of sensitive systems shorting out with the dissipation of the charge. This pair of automatic cannons is belt fed from an armored magazine located beneath the pilot station. The guns fire standard armor piercing rounds and are primarily for defense purposes against conventional armor and light Zoids within a kilometer. Mounted to either side of the pilot station, these light cannon assist in countering aerial threats and provide additional firepower against light armor targets. Each is built with a heavy armor shield to aid in protecting the pilot station from incoming lateral fire. Controlled by the ordinance engineer when ammunition transfer is not in progress, this pair of belt-fed machineguns is used as a universal defense against light vehicles and infantry at close range. Though limited in application against Zoids, the high-velocity rounds can be used against softer targets such as wings, canopies, sensors and heat sinks. While designed to manipulate and haul heavy loads, engineering claws that give the Sternclaw its name are quite capable of crushing many Zoids to scrap. They can extend almost 5 meters from their housing and have a spread of 7.4 meters, enough to grip and eviscerate the leg of a Gojulas. The EZ-205 Sternclaw fills a much needed niche in Zenevas ground-based forces strategy; an armored transport with far greater speed, agility and firepower than the PZ-001 Gustav. Sternclaws are deployed as independent and convoy transport units moving everything from parts and ammunition to troops and food stores. 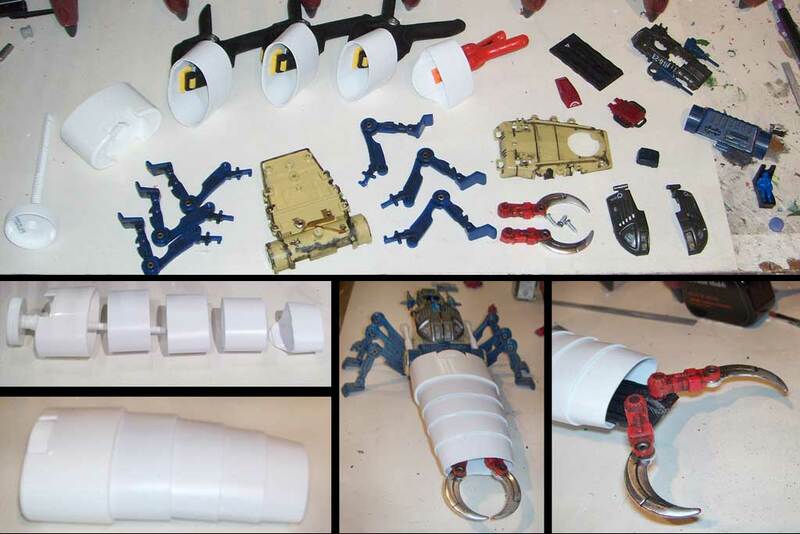 They are designed with modular abdomen sections and can be equipped for various other roles. 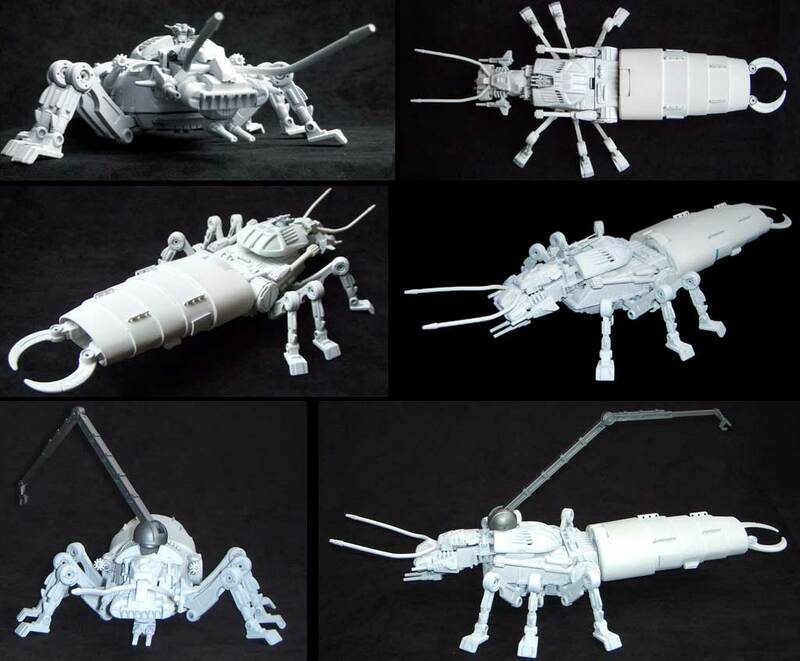 From early in the project I had wanted to build a tender for Fusillade, the way I had built Akyna for Gallant Mariner. I didn't want another over-gunned Zoid, but something that was more utilitarian in form. I settled on a form I had never seen a custom built of before; an earwig. 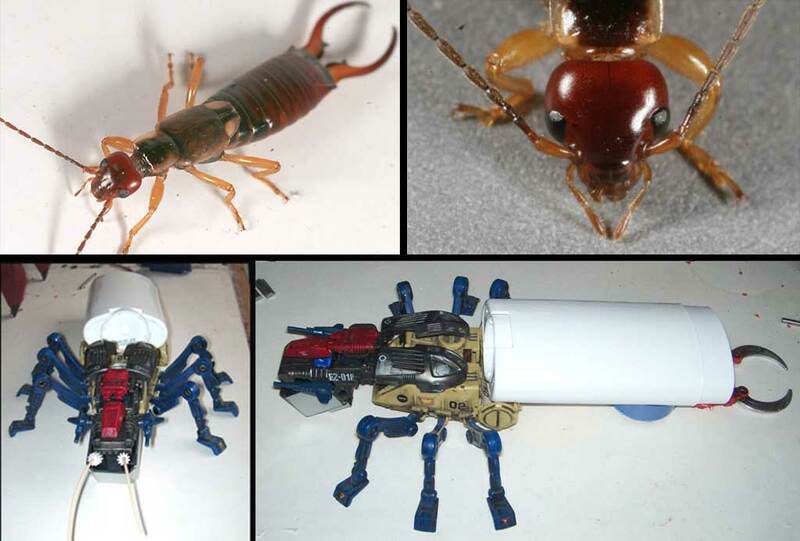 I had a spare insect toy body and wanted to use some parts from a dead Saicurtis, but the final bit of inspiration came from a VERY unusual source; the abovementioned Empire secret weapon! The basis of this build was an empty canister of underarm deodorant! This formed the abdomen. It’s open top and light weight influenced how it could be used; some form of cargo container with an open door at the end. I decided to make use of an old battery powered pseudo-Zoid mantis I have had for decades. Lining the canister up gave me the idea for the basic shape. The mantis claws were mounted at the stern to create the earwig shape. By the time it was done, the Sternclaw was a bit larger than anticipated, but its ability to hold the huge abdomen off the ground without any tricks made it a winner in my book. It still looks impossible! The earliest concept was a stack of parts and the deodorant canister. This version was shaping up to be a single seat cockpit, but that changed into the dual cockpit version. And so here we have an assemblage of disassembly. 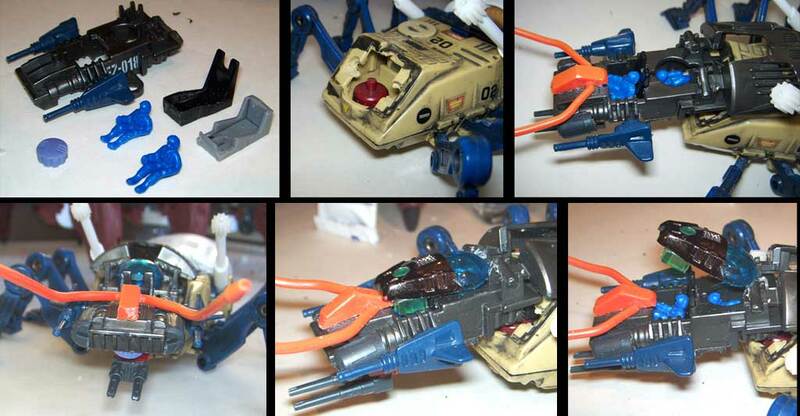 The mantis toy was taken apart, its motor removed and its battery compartment modified to carry guns. The deodorant canister was cut into strips and each was made shorter than the one before, allowing it to telescope (this feature was removed in favor of a stronger build and working internal mechanics). The Saicurtis components were shaped into the thorax and head. In the last two frames you can see that I used the Ultrasaurus' retractable ramp as a base to allow the claws to retract into the abdomen or reach out and grasp large loads. I do love how it turned out! Originally I did not intend the Sternclaw to have any heavy weapons, but after talking with some Navy friends of mine I changed my tune. A tender did not merely have the job of supplying a larger vessel, but in defending it during offload and to protect its cargo as well. I designed the shock cannons as a short range, energy hungry system to fill this role. I think they turned out rather well, and that they stow neatly out of the way was a welcome feature. After some tinkering I decided that the Sternclaw would require a crew of 2; one to pilot the Zoid and operate the main ordinance, the other as the operational engineer who would work the claws and cargo systems, as well as the backup heavy machineguns. I made an attachment for the reversed Saicurtis body that allowed it to swing a bit to the left and right, adding a little "animation" to the Sternclaw. The pilot would face forward but the engineer to the rear. The lid was an interesting challenge; one canopy to enclose both stations. The front half is heavily armored with green glass all around and above (more clear green sprue). The rear portion is a Deathpion eye glued to a nylon hinge and trimmed so it can slip over the forward seat-back and the wing hinges. In the final model this was painted clear green with excellent effect. If you notice in the first set of pictures after "History" (way at the top of this page!) the far right picture shows a subtle cockpit feature; the engineer control sticks and screen are actually built and attached to the glass dome! These slide through the notch between the wing hinges just in front of the engineer. When the canopy closes, the controls lower into place. In the primed shots you can see several details that can disappear with the darker paint. Note the eye cylinders cut from the hips of a Dark Spiner in the first shot. They make the Sternclaw scowl! You can also see the cargo tie-down bars along the upper body. These would be used to tie packs, food, gear or other cargo that would either not fit inside the abdomen bay or for troops to have ready access to. Finally, the last two shots show a feature I did not implement in any other images; the crane! 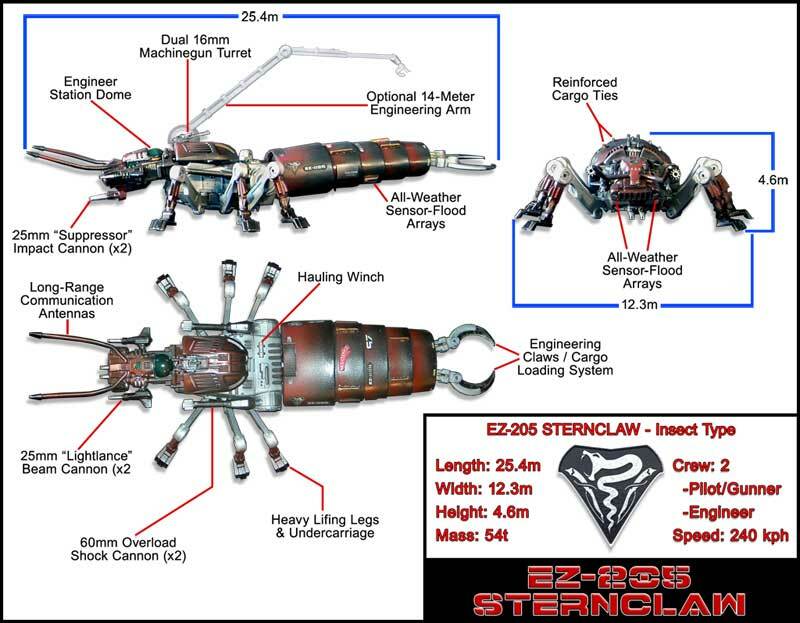 If required the Sternclaw can replace the defensive machineguns with a manipulator arm to assist in repairs or salvage. I ran out of time for the contest and decided I may return later to finish this feature, but I didn't want to do a rush job. You have gotten this far, please don't deglect any of the Fusillade team! You can follow the links below to find your way through the rest of this grossly oversized site! Sternclaws are graced with a rather solid Artificial Intelligence And Instict (AI-2) system. They have a minimal level of aggression and it seems to take a great deal to distract them. This was part of what made them ideal for the role of carrying ordinance into combat, and what made them a fit for delivering ammunition to a 500-ton centinaught with an overbearing level of aggression toward even allies. They are a good match for their operators, as well, as engineers tend to be more calculating and precise... and so they must be.